STATE oil company Petroliam Nasional Bhd (Petronas) is reviewing its second floating liquefied natural gas development (PFLNG2) and is now in talks that could see the project suspended for at least two years, according to Upstream, an international oil and gas publication. The weekly newspaper quoted a Petronas spokesperson this week, saying that construction work for PFLNG2 was “in progress,” but multiple sources had told them (Upstream) they were expecting to see it halted. The operator has been holding intense negotiations with the engineering, procurement, construction and installation contracting consortium comprising Samsung Heavy Industries and Japan’s JGC about penalties for suspending or even cancelling fabrication work, the sources told the publication. They added that Petronas’ decision to cut spending, reportedly set to involve reductions of up to RM50bil (US$11.8bil) over the next four years, in response to the falling oil price has strained almost all of its new projects. According to Upstream’s sources, PFLNG2, which also involves development of the Rotan gas field at Block H 130 kilometres off Sabah in Malaysia, is one of a number of projects that are likely to be hit by cutbacks. “Petronas is in talks with Samsung and JGC about the cancellation of PFLNG 2,” the weekly quoted a source, who claimed the Malaysian operator did not have the cash under its new strategy to allocate to project financing. However, another source told the publication that PFLNG2 has been confirmed for suspension for two years rather than cancellation, and that Petronas at best will take the hull only in 2018, reported the magazine. Upstream also quoted sources saying that discussions now focused on how much it would cost for Petronas to suspend the ABS-classed project, which would be cheaper than continuing fabrication till delivery. It is understood that Petronas has already called back some of its site engineers and managers from the Samsung yard. “The project is put on hold and Petronas has demobilised some of their engineers,” it reported. In addition, Upstream said the hull, which is already 80% complete, was originally scheduled for launch in April this year at Samsung’s yard at Geoje, adding that work on the topsides for the liquefaction unit, fabrication, of which has yet to start, was due to be carried out by JGC. The integration of the topsides and hull was originally planned for July next year, according to the weekly. Based on Upstream report, Petronas started building PFLNG2 in June last year following a decision to sanction the project in 2014 in order to monetise a series of stranded gas fields. It said PFLNG2 was designed for deep-water operations in water depths ranging from 500 to 1500 metres and has been planned to have a production capacity of 1.5 million tonnes per annum of LNG, as well as house up to 150 personnel for an operational lifespan of 20 years. The weekly said that other major contractors involved in PFLNG2 include Sofec, which is building a DNV-classed external mooring system in China, originally planned to be installed for 2017, and Air Products, which is providing the liquefaction technology, equipment and process licence. The suspension or cancellation of work on PFLNG2 would put a dent in the development of the Rotan field operated by Murphy Oil, the magazine said. It could mean the field development being rethought altogether, and may push first gas back by at least two years from the original schedule in 2018, sources told Upstream. The field is 80% held by Murphy Oil and 20% by Petronas, said Upstream, adding that the PFLNG2 floater was planned to be owned by Petronas and be leased to Murphy for about 10 years. 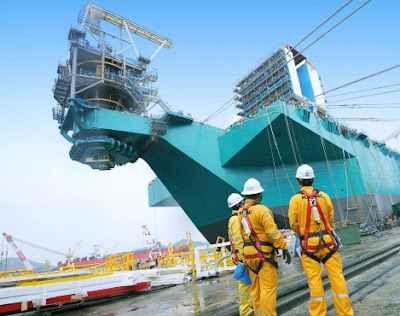 The report mentioned that Petronas’ first FLNG vessel – PFLNG1 – to be used to develop the Kanowit gas field, is far more advanced and is not thought to be affected by the budget cuts. And Petronas is scheduled to unveil detailed restructuring plans early next week, including major cost-saving measures. The weekly cited that chief executive Wan Zulkiflee would address company employees in a briefing on March 1 to reveal details on how it will cut capital and operating expenditure. In mid-January, a leaked internal memo indicated that Petronas wants to reduce spending by RM50bil (US$11.8bil) over the next four years due to the low oil price environment. Upstream’s sources said divisional changes were expected, pay cuts were on the cards, as were job losses, and possibly a reduction in the number of working days for some employees.